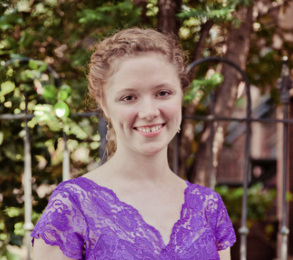 Rebekah Mackley has been awarded the music education area's award for "excellence in scholarship" in honor of her work on projects associated with her music education classes throughout her undergraduate career. She will graduate with her B.M.E. degree in May 2014. From York, Pennsylvania, Rebekah is the daughter of Jack and Mary Beth Mackley. A violin student of James Lyon, she participated in the Philharmonic Orchestra and also in Essence of Joy during her time on the University Park campus. She is currently completing her student teaching placement in Hollidaysburg, PA, working with cooperating teachers Martha Miller at Foot of Ten Elementary School and Jennifer Pappal at Hollidaysburg Area Junior High School. At Hollidaysburg, Rebekah has taught elementary general music K-6, assisted with elementary chorus, conducted the grade 7-9 orchestra, instructed individual and group string and brass lessons, and taught 8th grade general music. She is the recipient of the 2012 Essence of Joy Alumni Singer's Scholarship and the Harold and Nancy O'Connor Music Scholarship. Rebekah has been on the Dean's List all semesters of her undergraduate career. After graduation, Rebekah will pursue a teaching job at either the elementary or middle school levels.